For generations, Storyland inspired a love of learning and make-believe. In 1962, seven years after Fresno’s Playland opened it’s gates, Storyland welcomed children into a storybook wonderland full of “Three Little Pigs”, a castle, queens, cottages, a pirate ship and more. Storyland reopened in September 2015, after having to close its gates because the Park had so generously given to the community, but kept little to make its own necessary repairs and improvements. The fairytale Park was revived with the help of a brand new steering board, a renewed commitment by the City and overwhelming community support. Once again, the Park is renewing children’s love for storybooks and lighting up smiles with restored exhibits, new attractions and events throughout the year. After Storyland received so much enthusiastic support, Playland became the next revitalization project. During its debut year in 1955, Playland entertained over 250,000 visitors. It was a place where guests could enjoy rides, concessions, and take part in their community, a fun and affordable entertainment venue for the families and children of Fresno. And with help from Leadership Fresno, Lithia Motors, the Daniel R. Martin Foundation and many dedicated volunteers and community donors, Playland reopened in May 2016. Today, we hope to provide affordable family fun for many generations to come, and to make Storyland and Playland places where learning, laughter and lightheartedness are always in the air. At Storyland, fairytales come to life. Follow the path through the Park and find Humpty Dumpty, “three little pigs,” Mother Goose, Alice in Wonderland, witches, pirates, a castle and much more. Use your magic key to unlock our talking boxes and listen to stories of adventure and danger, fantastic worlds and heroic journeys. 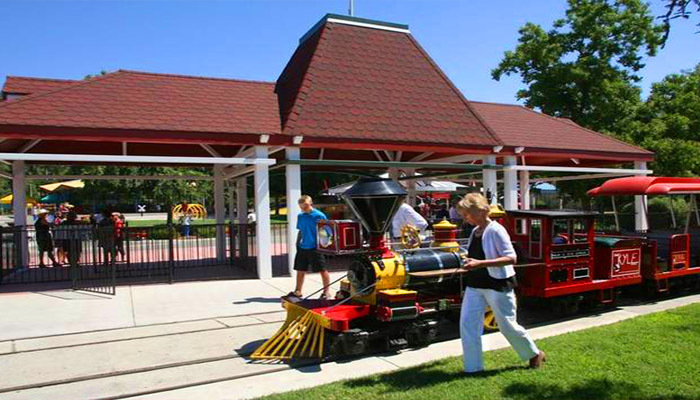 Take a ride through Storyland and Playland on the Willis B. Kyle Express Train. This historic train is named after Willis B. Kyle, 40-year Fresno resident, President of Kyle Railways, Inc., and railroad industry innovator. Climb aboard and enjoy a relaxing and scenic tour of the Parks. All year long, the outdoor Theater at Storyland will host performances by local storytellers, musicians, singers, dancers, magicians and more. Check our calendar of events to view our upcoming shows and special seasonal performances.